The PEN Ten is PEN America’s weekly interview series. 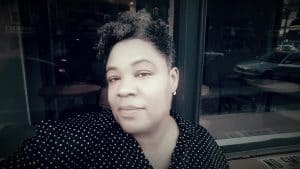 This week we speak to Kamilah Aisha Moon, whose poetry collection, Starshine & Clay, was released this fall from Four Way Books. There was a slow-dawning recognition that allowed me to accept the mantle of “writer,” understanding that it is a role and responsibility that is assumed in a long chain of many others that came before and will come after. As an educator, I love witnessing this awakening and claiming in others. A consistent trait I’ve noticed among the writers that I know: They have been keen, highly sensitive observers since they were very young, spellbound by language and how it works. Writing, regardless of genre, moves and changes us when it strikes universal chords of truth. Generally, inauthenticity is discordant, rings hollow. Facts seem immutable, but they are used to construct reality and serve experience, which varies so widely and seems inextricably tied to what one believes. Belief is a state of mind, subject to any mind’s quirks and frailties. To the best of my ability, I try to stay in my “right” mind, consult my inner compass, and honor what is indisputable. We’re in perpetual conversation with each other across space and time. When you synthesize incredible writing and respond through your unique lens, body—the specific geographies literal and spiritual that you’ve traveled, that’s inspiration. Particularly when there is a deep reverence and attribution of a source or lineage. Allusion, sampling, and collaging often lead to innovation. A group of writers recently collaborated on a flash fiction piece that was inspired by a poem I wrote. Each of the 10 writers were assigned a line from my poem, and wrote a 100-word fiction that begins with the assigned line. They wrote subjectively to my words as a prompt. The result was a 1,000-word episodic story that is respectful of and energized by my words. I was stunned by where each writer leaped, by how their voices “danced” with mine. It is an entirely new work that has traces of my poem’s DNA. I feel so honored that they deemed my poem worthy to engage in this way. As a person who doesn’t fit into many social categorizations neatly, not only do I resist limited norms and expectations, I’m also resisting my internalization of them in order to see myself clearly and lovingly. Layers, whew! This devastating wave of fascism in all of its forms sweeping the planet. I know this is just the most recent incarnation of what has always existed, but it feels more virulent than ever—here in America, pretenses are dropping completely and we’re experiencing the fast erosion of this right. Net neutrality, et al . . . we are being challenged right now. Instances when I’ve called myself out on my stuff unadorned have come close to the most daring thing, which I’m still approaching. Some posting, some stalking, a growing desire to shun while also appreciating the positive aspects of virtual connection. It is a deeply fraught relationship. I’ve exchanged wisdom and fellowship with writers I might have never met otherwise. We celebrate, mourn, and lament together through this medium, but it also steals time away from our own thoughts and separates us from the people around us when we’re in those silos. 9. In an interview with Waxwing, you said that poems “often serve as cultural artifacts of an era, and poets can function as emotional historians.” In looking at today’s world, are there past cultural artifacts you find yourself turning to in our present times? What about emotional historians? Yes, so many. Poets who were creating furiously and fearlessly during periods of epochal change in the 20th century are resonating most lately. The ones who dared to shout and sing their stanzas in the direst, most uncertain hours. McKay, Hughes, Walker, Brooks, Ginsberg, Baraka, Rich, Lorde . . .
10. Finally, if you could require the current administration to read any book, what would it be? The books that come to mind are so beyond the president’s reading level and emotional maturity . . . Baldwin stands out to me as one of the most poetic and prophetic. The Price of the Ticket, his collected nonfiction book that contains the essay “The Creative Process” written in 1962. It remains a masterpiece, its truth and logic key to our collective salvation.